Arjumand Bano Begum christened by Shah Jahan as Mumtaz Mahal, meaning the "chosen one". 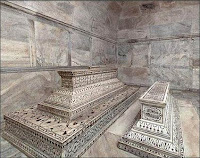 Shah Jahan lost Mumtaz Mahal when she got giving birth to their 14h child. 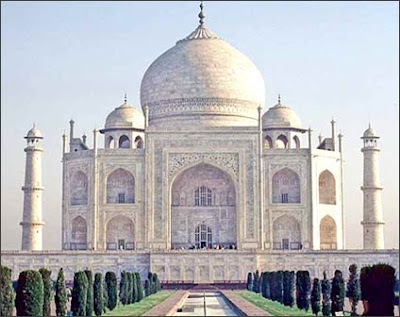 It is believed that in her last breath Mumtaz secured a promise from Shah Jahan that he would construct the most beautiful monument in the her memory. For the transportation of the construction materials, more than 1,000 elephants were made use of. One of the ornamentations done on the surface of the Taj Mahal is the beautiful calligraphic work. 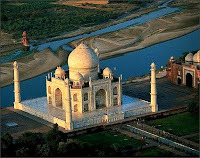 The calligraphy of the Taj Mahal mainly consists of the verses and passages from the holy book of Quran. It was done by inlaying jasper in the white marble panels. These passages were inscribed by a Persian calligrapher, Amanat Khan in an illegible Thuluth script. A number of the panels also bear his signatures.